In 1904 President Theodore Roosevelt decided to improve the American coinage, which he felt was ‘artistically of atrocious hideousness’. Thecsculptor Augustus Saint-Gaudens created a beautiful new design featuring a stunning version of Liberty striding towards us, almost out of the coin, her dress flowing in the breeze on the obverse, and a realistic eagle on the reverse. 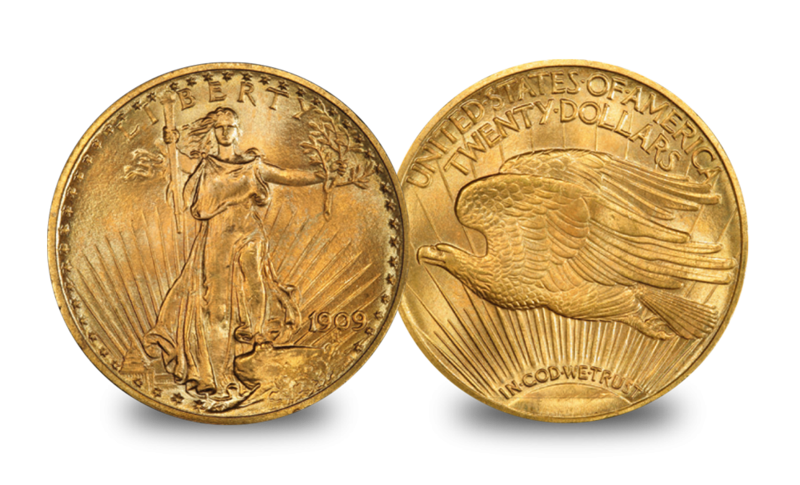 The first Saint-Gaudens double eagles (1907) were minted in high relief, but production problems meant that a lower reliefcversion was quickly introduced. So too was the motto ‘In God We Trust’, which had featured on all US coins since the American Civil War, but was absent from the double eagle in 1907–8. Saint-Gaudens double eagles were issued until the end of circulating US gold coinage in 1933 and the coin presented here is the sister of the world’s most expensive gold coin – the 1933 Saint Gaudens double eagle, an example of which sold in 2002 for over $7.5 million. These coins are a relic left behind from a bygone era that should have been melted down when America changed the Gold Standard. They are incredibly difficult to find outside of the US, however the Dublin Mint Office has been able to obtain a few select examples.